Richard - So we've just opened up the hinge of a large trap door of the floor to reveal - it's like Harry Potter this - a staircase that goes down beneath the lecture theatre! So let's head down the stairs. Richard - Okay, so we've come in to what appears to be a concrete lined room with a bit of water dripping from the ceiling and there are three hefty concrete blocks on the floor like enormous pieces of Lego. Brian - Well these are what we call piers and they're built directly onto the rock of the hill. This hill is an old volcano and these piers are built directly onto it and if you look around, you'll see that the floor is actually suspended, so that when we're walking around on the floor in here, we don't actually come into contact with the piers. And on the piers, on each of the piers, there's a seismometer which looks like a very large tin can, but they're actually incredibly sensitive devices. They can pick up vibrations that are around thousanths of a millimetre. Richard - What are you picking up on these seismometers? Brian - Well we pick up earthquakes from all around the world, so large or even moderate sized earthquakes from the other side of the world. We also pick up vibrations that are rather closer to home and we actually detect between 100 and 200 earthquakes that come from the British Isles and immediate offshore areas every year. Richard - So 200 a year in the UK? Brian - Up to 200 a year. Richard - Now this is part of a network, isn't it? This isn't the only one. There are secret vaults around the country. Brian - Yeah. We have about 100 instruments all around the country. Not all the vaults are as big as this one. Some of them are in underground tunnels or old bunkers. Some of them are just buried in holes in the ground. The data from all those instruments is transferred automatically using the internet, back to our offices in Edinburgh and then we can analyse that data and use it to work out exactly where the earthquake was, when it occurred, and how big it was. Richard - Well we made it out of the vault and into the offices of the British Geological Survey. Now Brian, this office was where you used to analyse the sounds of earthquakes. Brian - That's right. This office is what was called the replay lab and although nowadays we record all our data digitally and analyse it using computers, 10 years ago, all our data used to be recorded on analogue magnetic tapes. Our analysts would listen to these tapes, speed it up about 50 to 100 times and then they would use their ears to tell the difference between different types of seismic events. Richard - And you've got some of the recordings of earthquakes, some of the things you can hear. Brian - So that was a magnitude 5.4 earthquake from North Wales, recorded somewhere in Britain. 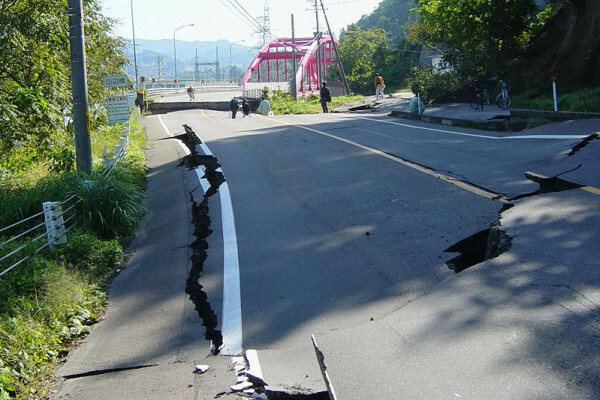 It was actually the largest earthquake that we have a recording of in our archive. You can tell when you listen to it, it's actually quite a distinctive double sound and that's because there are two seismic waves that propagate when there's an earthquake through the Earth, and those travel at different speeds and arrive at the receiver at different times. Brian - The next one is an underwater explosion. So typically, we pick up quite a few of these underwater explosions every year. It's when the navy, quite often, they find old world war II mines or perhaps the navy are doing some kind of naval exercise from where they're setting off explosions in the water, and we can pick them up. Richard - Sounds like a shot being fired. Brian - That's right. So, much, much higher pitch, completely different type of signal. We didn't have the distinctive double bang. We just have this kind of relatively high pitched pop, if you like, which you can think about in terms of something that will pop in the water,creating a huge bubble. Richard - And the final one. Brian - So the final one is a magnitude 6.9 earthquake from Japan. So the vibrations from this earthquake have travelled all the way through the Earth and have been recorded here. Richard - So let's get this straight, that was a recording made here of an earthquake in Japan, on the other side of the world? Brian - That's right. When you have really large earthquakes, huge amounts of energy is released and that energy travels all the way through the Earth and we can pick up the vibrations from that earthquake. Have earthquakes been more frequent recently? How do toads predict earthquakes?